United Nations Assistant Secretary-General for Political Affairs, Miroslav Jenča, on Monday, paid a courtesy call on President Abdulla Yameen Abdul Gayyoom. 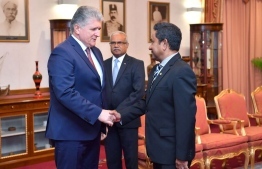 During the meeting held at the President's Office, the president conveyed greetings and well wishes to Jenča on behalf of the Maldivian people and government. The president further noted that the Maldivian government will continue to maintain a close relationship with the UN. Speaking on the upcoming presidential elections, President Yameen gave full assurance that the government will take all necessary actions to ensure a free and fair election. The Assistant Secretary-General thanked the Maldivian government for extending an invitation and praised President Yameen for the economic developments achieved during his regime. Jenča also noted the peaceful and calm environment in the Maldives during his visit. With the upcoming presidential elections slated for September 23, he expressed readiness of the UN to work with the Maldives Elections Commission (EC) for a free and fair presidential elections. The president was joined by Minister of Foreign Affairs Dr. Mohamed Asim, the Minister of Fisheries and Agriculture Dr. Mohamed Shainee, the Minister for Legal Affairs at the President’s Office Aishath Azima Shakoor and the Minister of State for Foreign Relations at the President’s Office Mohamed Naseer for the meeting.